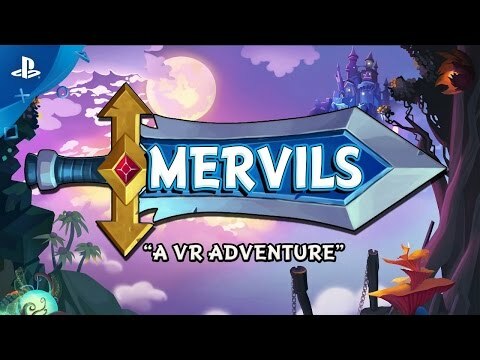 Mervils is an open-world RPG platformer built specifically for third-person VR. Explore the four picturesque worlds and save the Mervil Kingdom from Balazar the Evil! With merely a sword and a few coins your quest begins in the Mervil Countryside. The pages of the Great Mervil Book have been scattered throughout the land and the dark sorcerer Balazar the Evil has risen from the shadows. It’s up to one brave hero, to collect the lost pages, rebind the Great Book, and defeat Balazar once and for all. Will that Mervil be you? Mervils has 6-8 hours of content and tells a heroic story of your adventure throughout the kingdom. You explore the four vast Mervil Worlds and learn the kingdom was protected by a magical force-field, upheld by the power of the Great Mervil Book. With the pages of Great Book being scattered throughout the worlds the magical barrier has begun to diminish and now at the time of greatest weakness, Balazar has plotted his return and seeks to destroy you and the rest of your people! Your character begins the journey with a simple sword, no armor, and merely a few coins, but the Mervil Armory is filled with helmets, bracers, pauldrons, axes, and swords to help defeat your enemies. Your sword is not the only weapon in the lands, find hidden catapults and ballistas to destroy Balazar's enemies and seek out cannons to fly high through the Mervil skies. Throughout your quest you will find puzzles designed specifically for VR, use your head to unlock hidden treasure, to navigate through complex labyrinths and even to balance on a tight rope thousands of feet in the air. Choose from a "Blink", smooth follow, or custom camera mode. You have a variety of options to fit your play style and comfort level.